Hair straighteners are an absolute essential for every girl these days. Whether your hair is frizzy, dry, or oily, straightening it will leave a much smoother finish and give you an entirely new look. Since the trend has risen to such a great level, manufacturers have come up with many different types of straighteners for different types of hair. In such cases, this MHD Professional product is the most ideal hair appliance. It can solve all your ‘bad hair day’ problems within a couple of minutes. This product comes with various features that can make the entire procedure of straightening hair extremely simple. The 3D floating plates make this flat iron different from others. The main thing to remember about these steel plates is that their direction can be quickly manipulated for your ease; it immediately follows the direction in which you apply the force on your hair. Its 3D shape ensures that every strand catches the heat and is straightened efficiently. 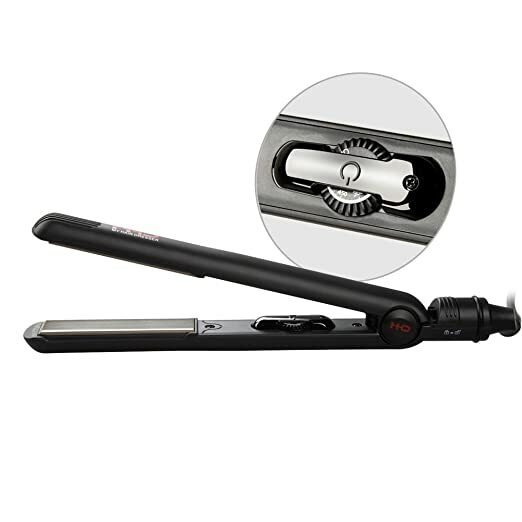 Moreover, you can use this straightener to create other hairstyles such as curling the tips or creating a wavy texture. No matter what the case may be, the heat level is ideal for all and the plates are perfect for securing the cuticles of your hair. Various hair textures require different temperature settings. At times, the particular temperature that suits your hair may not suit somebody else’s. Also, sometimes you may be in a hurry and need to straighten your hair faster than you usually do, so a slightly higher temperature can help you in this case. With the MHD Professional, you can adjust the heat level quickly according to your needs or whoever may be using your appliance. There are three temperatures you can choose from, which include 120 degrees Celsius, 180 degrees Celsius, and 230 degrees Celsius. The iron rod also has an LED display which shows which temperature you have selected. The product weighs 12.8 ounces, but the shipping weight is 14.1 ounces. The iron plates are smooth and an inch wide; they make the straightening process quick and effortless. Your hair will be shinier and smoother after you are done. The edges are contoured. They ensure that your hair is perfectly straightened with your desired waves and curls, leaving them with a professional touch. There are three different temperature settings. You can choose any one of them that is suitable to the texture of your hair. The power cord is 2.65 m long. This length is ideal for many users; the cord is also quick to wrap along with the straightener when you need to keep it away. There is a handle lock as well; this ensures that the product is stored quickly. It gets rid of negative ions to make your hair look more natural; it also ensures that the original moisture and color of your hair does not wash away. It has a unique sleep mode option. The straightener automatically switches off when you stop using it for a particular period of time; this feature is an essential when you’re extremely busy in getting ready for any event or function. The appliance arrives with a 1-year replacement policy and a 2-year warranty. Many users bought this appliance for the women in their lives and they loved it. Another user was very happy with the iron plates since she had ceramic plates before. She also stated that despite having thick hair, it took her only half an hour to straighten her hair, whereas with her old appliance, it took over an hour. 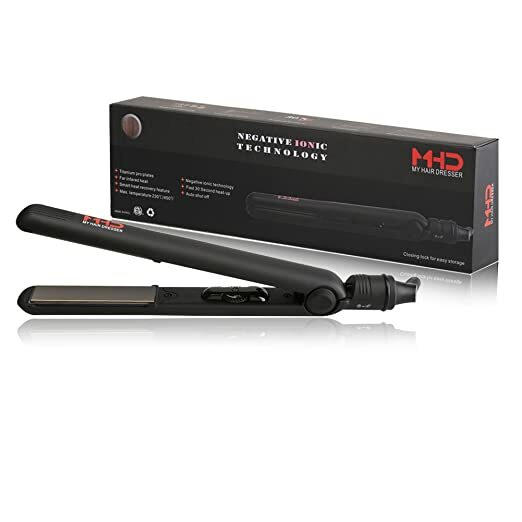 A similar customer mentions that the MHD Professional actually cut down her straightening time from forty minutes to twenty minutes; you must also keep in mind that her straightening speed was not so fast, yet it did not consume much time. Another delighted customer praised the way the product curled her hair into professional-looking locks. She also finds the wiring very convenient as there is a small space under the rod to tuck the cord neatly. There was another user who stated that the straightener removed frizz from her hair successfully. The titanium blades have also been well-received by many consumers. It ensures that your hair is left smooth and shiny after the procedure is complete. Also, it makes sure that the plates heat up properly. A customer advised not to turn up the temperature till the maximum as it becomes very hot. On the other hand, there were some complaints too. A particular consumer complained about a burning smell that she experienced while using it for the first time. However, she also mentioned that after using it for a couple of times, the smell vanished. Another user had a similar concern, but she spoke about a particular buzzing sound every time the appliance was switched on. A different customer was furious with its performance as she claimed that it did not heat up on time. Someone else mentioned that the appliance pulled her hair slightly and caused some of it to fall too. Some other people with thick and curly hair complained that this product was just not for them. The MHD Professional is the ideal product for users who want good quality at a low price. You need to be careful of a little things, but overall, the appliance is excellent. The extra features it provides are very hard to say no to!